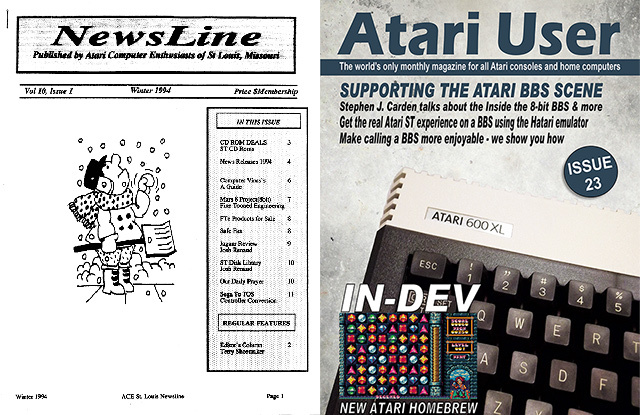 Today I had an article published in an Atari-related periodical for the first time since 1994. I wrote two articles for the Winter 1994 issue of the ACE Newsline; one was a review of the Jaguar, and the other was about the ST disk library. I wasn’t a writing prodigy. It’s just that the publisher, Terry Shoemaker, was desperate for articles. Atari was dying, and so was the club. But that didn’t dampen my teenage enthusiasm. Fast forward almost 20 years. The old Atari Corp. is long dead, but enthusiasts remain. There are still Atari BBSes (you can telnet to them now!) — and even an Atari magazine (by subscription, distributed as a PDF). That magazine is AtariUser. When I heard they were going to have some stories about present-day Atari BBSes, I submitted my blog post on how to telnet using old Atari ST term programs within the Hatari emulator. The article was published in issue 23, released yesterday. I guess I’ve come full circle! This entry was posted in Uncategorized and tagged ace-st. louis, atari, atariuser, magazine, newsletter, publishing, writing on Apr. 29, 2013 .